After studying fashion and costume techniques, designer Giulien T, born in 1985, decided to embark on an artistic career in antique furniture where she specialised in gilding of frames and statues. In September 2015 she experimented the application of 24 karat gold leaf on leather and consequently decided to make use of this technique to create unique and refined handbags embellished with gold details. That's how 24 Karati was born, the Padua-based company is now constantly searching for high-quality materials and providing the renowned made in Italy which makes the brand exclusive and places it in the luxury market. The distinctive feature of the brand is the design of geometric figures, the result of an exotic inspiration, the arabesque: an homage to the ancient Islamic mosaics recalling suggestions from the Castle of Sammezzano located in Leccio, in the heart of Tuscany. Designer Giulien T. together with designer Daniel De Faveri, creates unique fashion items, trendy handbags for a woman looking for the exclusivity of handcrafted products without giving up on a luxurious appearance; it is an elegant and precious new jewellery concept. The company aims for the insertion in worldwide markets in the most prestigious multi-brand shop windows, luxury malls and boutiques. In order to make the 24 Karati experience even more unique and personal, the brand also offers an exclusive product customization service to all his costumers. From the inspiration of gold, brand's characteristic, a new capsule collection is born. A revisitation of the continuous models "bahira" and "amal” with protagonists materials of trend and value. Leather and velvet join the style and luxury concept. 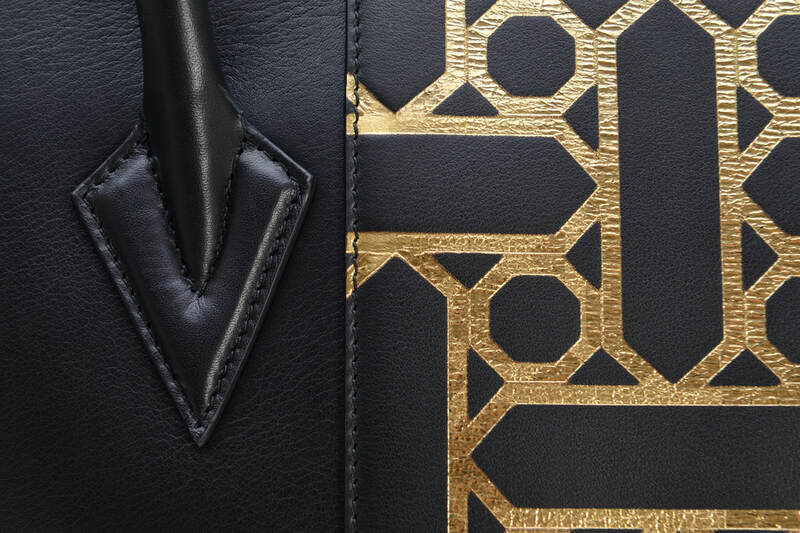 AMAL is a luxury concept bag: inimitable, completely handcrafted in calfskin and velvet with its contained but sinuous shapes, it presents a modern cut defined by the pure 24 karats gold leaf details. This piece, with its magnetic closure, is characterized by an elegant and luxurious gold-plated diamond chain. Inside it shows a zipper pocket and the distinctive 24k silver lining. Buy an AMAL bag and support The Wishwall Foundation. A percentage will go to help making meaningful wishes come true. The Suheila is a medium size handbag with soft shapes, a casual trunk bag with an elegant and precious taste entirely made of fine calfskin. The contrast of the 24karats golden leaf in the lateral cuts gives magic and uniqueness to this item. The gold-plated logo and the hanging charms are an ever-present dainty detail. The bag shows a deep double zipper, inside it provides a small open pocket, a zipped pocket and the distinguishable 24k silver lining. The Abir handbag is entirely made of precious calfskin, in a large size for those who look for comfort without giving up on an innate elegance defined by a central cut embellished with the 24 karat pure gold leaf. 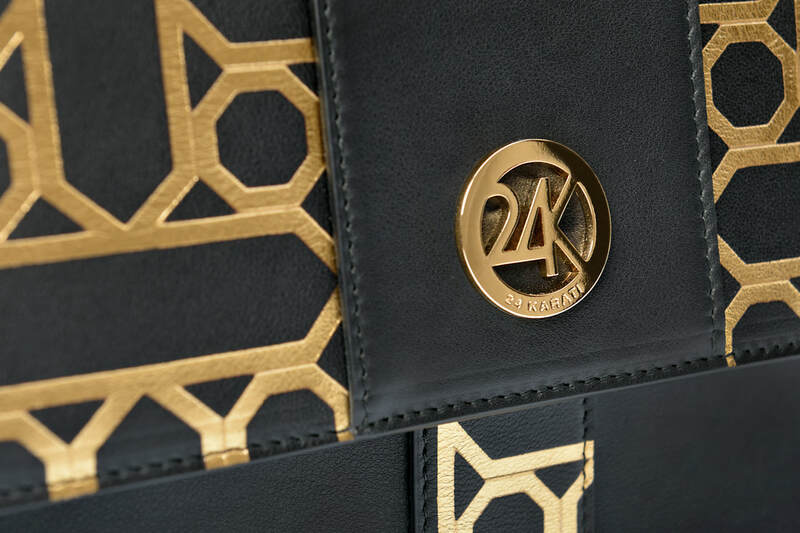 Inside it presents an open pocket and a zipper pocket, a silver lining with the 24k logo and hanging from the handles it shows the brand's iconic charms. All models are available in the presented colors when ordered. ​you can request a customized private aim if you are looking for exclusivity.